Super Savings Item! Free Shipping Included! Save 40% on the USB C Hub, ALLEASA 8 in 1 Type C Adapter with 4K HDMI, Gigabit Ethernet, 100W USB C Power Delivery, 3 USB3.0, SD TF Card Reader for MacBook Pro 13'' 15'' 2018/2017 Chromebook DELL XP Windows (Grey) by ALLEASA at Pacs BG. MPN: GN30H. Hurry! Limited time offer. Offer valid only while supplies last. View More In Hubs - Page 2. ►【8 in 1 Instant Expansion】This usb c dongle instantly add an extra USB C Port, 4K HDMI,1000M Ethernet Port,SD/TF card port, 3 x USB 3.0 Ports to your Macbook 2018/2017/2016/Notebook/PC/Laptop. ►【Fast Data Transmission & High Definition】Ultra-fast data transfer with a speed of 5GBPS for 3x USB 3.0 ports. Use the hub's 4K HDMI Port to mirror or extend video to a HD monitor. ►【Stylish Design, Advanced Heat Management 】Aluminum Enclosure and High Strength Cable Provides additional durability to this type c usb hub. Superior quality, slim and compact design makes it perfect for travel. ►【EASY TO USE】No additional installation or software necessary. 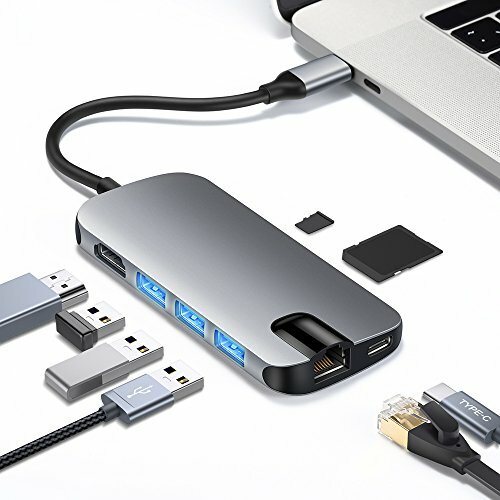 An ideal USB-C expansion hub for Apple MacBook Pro, Google Pixel, ChromeBook, Dell XPS, Huawei Matebook and other type c devices. Works on Mac OS X 10.6 or higher; Windows XP, 7 or higher; Chrome OS; USB Type-C port available. ►【100% MONEY BACK】The usb type c adapter has 1 Year warranty.We take care of all quality-related issues with a replacement or refund. Please contact ALLEASA support team if there is any problem. If you have any questions about this product by ALLEASA, contact us by completing and submitting the form below. If you are looking for a specif part number, please include it with your message.